NYC is pretty green, but we can be greener. A livable city is a sustainable city, where we leave a clean environment for the next generations of New Yorkers. I am absolutely committed to fighting climate change, creating green jobs, and cleaning up our city. As Public Advocate, I will establish a team in the Public Advocate's office dedicated to environmental issues. Their job will be to hold the City accountable on environmental issues to make sure we are on track to meet our goals, and to put forward new ideas to fight climate change and protect the environment. The Public Advocate shouldn’t only advocate for the people of New York City, but also for the environment that sustains us. With the White House ignoring the scientific reality of climate change, it is imperative that all cities make environmental sustainability their top priority. I'm proud of my record standing up to protect the environment, which has been recognized by the New York League of Conservation Voters Environmental Scorecard and the Sane Energy Project. Though New Yorkers are already known for having a low carbon footprint per capita, there is still too much pollution in our city. We can think creatively about ways to protect our environment and stand as a much stronger environmentally-friendly role model for the rest of the country. New York has seen record-high temperatures the past several years, while lower-income communities have the worst air quality in the city leading to asthma and other health problems. Climate change will continue to impact the globe if we don’t make changes quickly, and those in marginalized communities will end up the most at-risk. We can’t afford to wait another twenty years to achieve 100% renewable energy like some politicians want to. If the world waits that long then our friends and neighbors in Southern Brooklyn, Long Island City, and even parts of Manhattan are going to have the rising sea at their doorsteps. 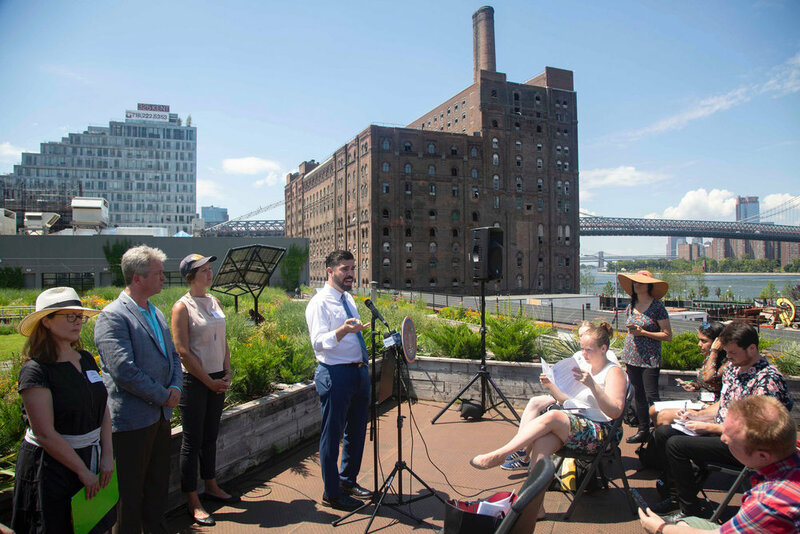 I have already introduced legislation to require every rooftop in New York to have solar panels generating clean energy or a garden growing healthy food for the people who live in that building. As Public Advocate, I will work to promote and expand programs that train our city’s young people to install solar panels and build and maintain rooftop gardens - starting with people who live in NYCHA housing being trained and employed to transform their own buildings. Require every rooftop in NYC to be green (with solar, wind, or agricultural output). Expand training and employment programs for young people in the clean energy and urban agriculture industries, funded by working with the City and State Governments to end fossil fuel subsidies. Create regulations that will help promote and protect urban agriculture in our city. Phase out the sale and distribution of all single-use plastics, while offering strong alternatives. Invest in more green spaces in all communities by cleaning and preserving empty lots. Push for the expansion of bikeshare programs into underserved communities. Allow for small businesses to install electric vehicle charging stations on sidewalks.